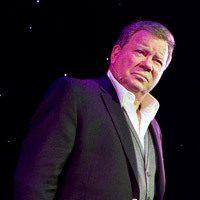 I don’t care what anyone says, I adore watching William Shatner, in just about anything. Sure he’s narcissistic, but he uses his superpowers for good, not evil. He’s also funny, silly, asinine, but always charming. If you can see this one-man show live, awesome, luckily there’s also a DVD. 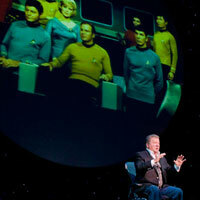 Dressed casually Shatner leads us on a magical tour of memories, ours and his. He shares very personal stories, famous encounters, ridiculous exploits, and talks about Star Trek (of course) all in that oddly heartening, exaggerated style that’s so many have mocked over the years. If you’re not a Shatner fan, watch something else. 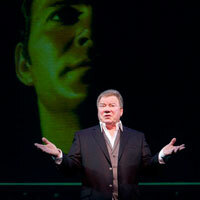 The whole show was pure Shatner – eccentric, engaging, and egocentric, but with a heart as big as his head (tough to do). He makes me smile. I wanted to meet him at a comic convention. But I would have to mortgage the house. 🙂 It might be worth it for 10 minutes with Shatner. When I watched Star Trek as a child in Germany, I had a huge crush on Shatner (aka Captain Kirk) and Spock. So, this series is a fond childhood memory.